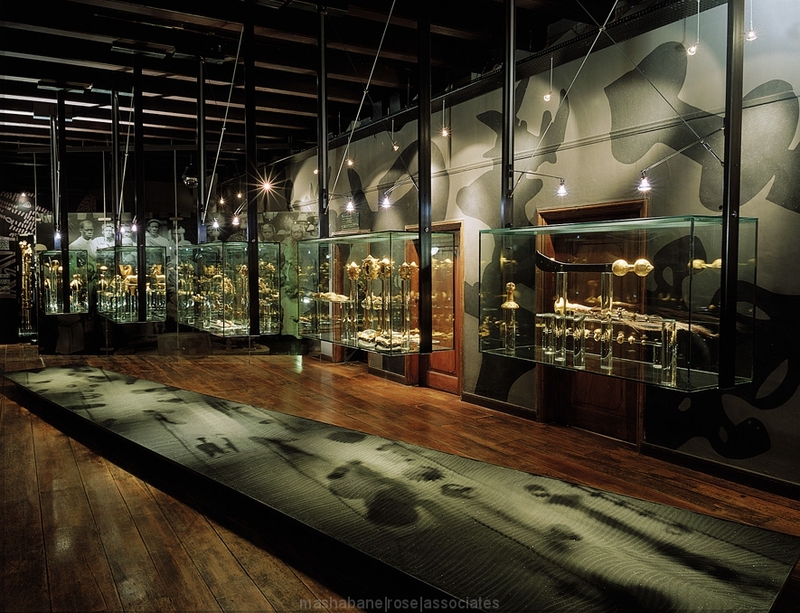 LOCATED IN A 300 YEAR OLD CAPE DUTCH BUILDING, THE GOLD OF AFRICA MUSEUM SHOWCASES A COLLECTION OF PRECIOUS GOLD ARTIFACTS FROM ACROSS THE CONTINENT OF AFRICA. THE CAREFULLY INSERTED CONTEMPORARY EXHIBITION RESPECTS THE EXISTING LAYOUT AND STRUCTURE OF THE HISTORIC BUILDING (WHICH IS A PROTECTED NATIONAL MONUMENT) WHILE MAKING NO ATTEMPT TO COPY OR MIMIC IT. INSTEAD, BETWEEN THICK WALLS, IN THE STATIC ROOMS, THE SHOWCASES SPARKLE UNDER DELICATE SUSPENDED LIGHTING AND THROW VIBRANT SHADOWS ACROSS THE OLD BRICK WALLS AND TIMBER FLOORS. A RESTAURANT AND GLASSED JEWELER WORKSHOP COMPLETE THE COMPLEX.